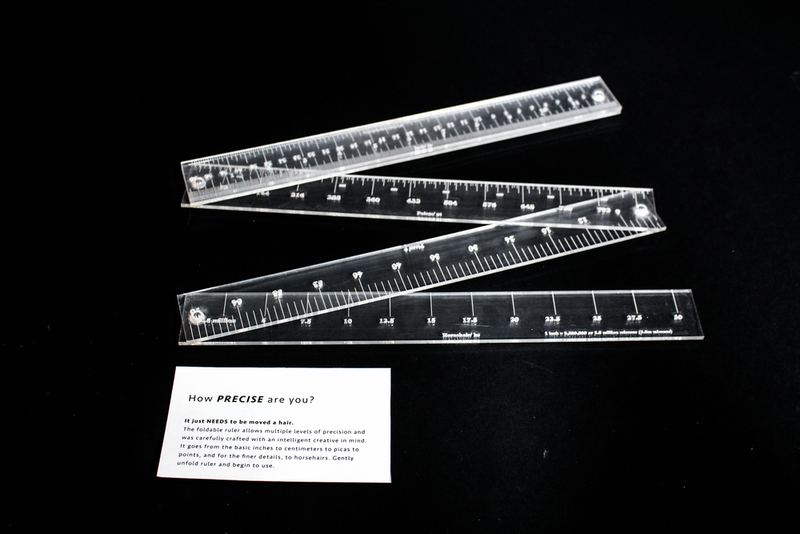 This piece is an interactive project highlighting the absurdity of the measurement system or rather the imaginary human constructions that have helped build and define the world we live in today. By the simple question being posed of asking "how are you? ", there is a measurement being created purely by comparison. Whether it is by fact, statistic, experience or feeling— all of which are constructions that exist in relation to something else. The ruler is the most "defining" form of measurement. It is a standardized language used to create infrastructure and aid design. as a result I created a ruler that unfolds, while the measurements get increasingly "precise" as a commentary on this bizarre concept. starting from inches, to centimeters, to picas, to points, to horsehairs (1inch:2.5 million horsehairs)Ridiculous right? Thought so. a tool box that requires your steady hand to control the direction in which your pointer finger moves. put on the magnetic glove. attempt to push the center most cork to achieve "perfect control"
Using the x and y axis, pick the category you fit into. Upon choosing, find your chip and turn it over. The chip reads your level of minimalism. 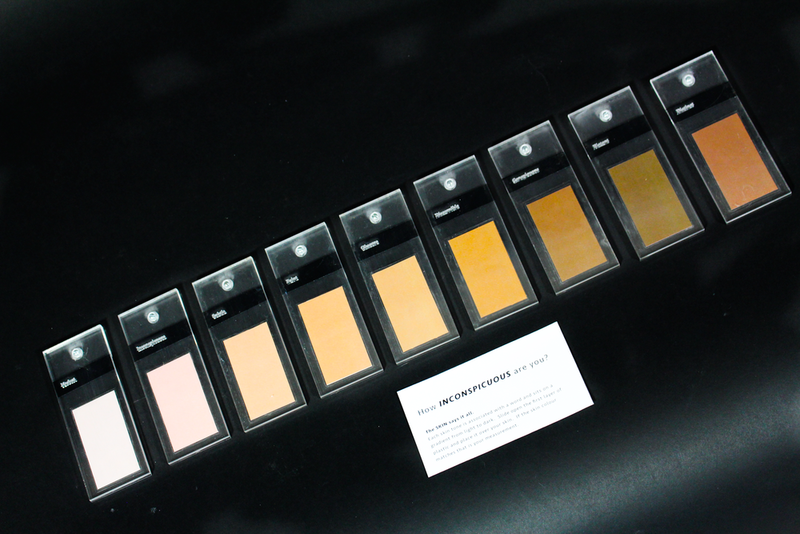 using skin tones, each tone reflects a different level of conspicuousness in society. it exists as a fictional community of DIY Bike activists demanding a bike friendly culture from their city. To do this, they take it upon themselves to be heard and show the city the importance of getting more cyclists on the road and an infrastructure that respects them. The community gains access to a website where they are able to share and create DIY gears and use them to advocate for the cause. Some of my key focuses for this project were potholes, the relationship between cars and cycles on the road, and getting the information out! A raincoat structure that is the dimensions of the average car, almost 12 ft in length and 6 ft in width. A week later pothole was fixed, including all those surrounding it. Is there a more interactive experience to take in stats and data? Within a tangible space or as an object? What are the many ways this data can be experienced? Through what senses? 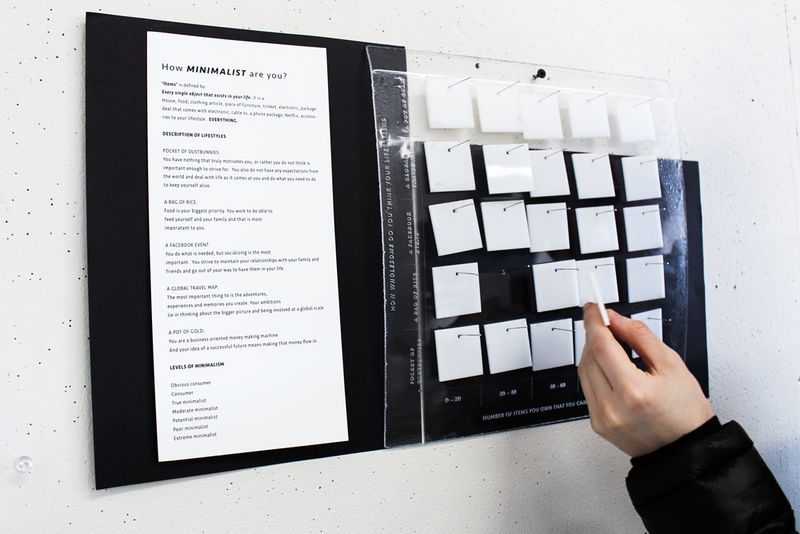 Are there more than 5 senses that we can explore to experience data? Part 2 | Do we have more than 5? Proprioception: The sense of understanding your body in relation to the space around you. 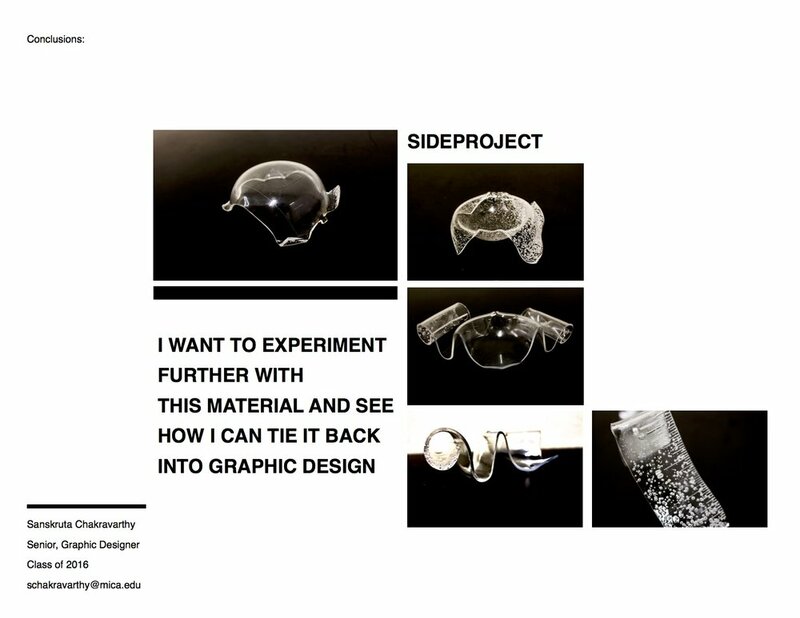 INTRASTRUCTURES has work that is very closely related to my research and what I want to investigate further in my work. Its manifesto describes an almost socialist utopian design firm aiming to create with and for eachother, and as sustainably as possible. The sense of perceiving your body in a space while playing a sport, riding a bike, dodging an obstacle are all proprioceptive senses. Why do we single out and categorize the 5 senses from what our body just naturally does. J.Krishnamurti was a writer on philosophical and spiritual subjects. In the following video, he explains that the humans attempt of understanding the “super-sensory” experience is mindless and done much more out of boredom. The 14th: Introduced to the Dutch students and their research projects. The 15th: Our second day involved creating digital memory and understanding how information is saved on a device, using binary data and how that gets saved on an 18 bit circuit board. Our group soldered the circuit boards while a second group was responsible for creating the wiring andweaving, and a third group was responsible for conceptualizing how this process can be used. 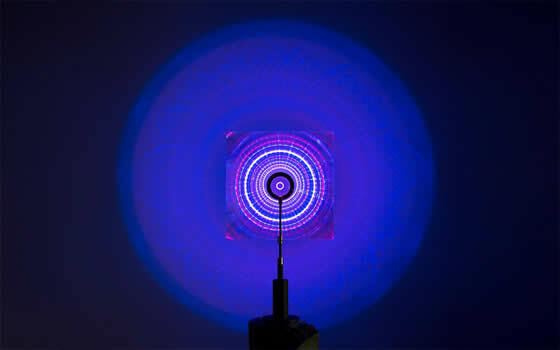 The DDW in Eindhoven, a large exposition and exhibition with 500 different locations, was a lot of exposure to what is happening within design and technology across the world. I focused my visits on the Undergrad/ Grad exhibition of the Eindhoven Design Academie, one of the larger exhibitions in the Strijpe-S area. Students were experimenting with material, technique, production and execution with concepts ranging from bio-technology to sustainability and much more. Proprioception in Media art Mechanisms of Augmentation in Proprioceptive Media Arts. The Snoezelen: Dutch word that means sniff and snooze. Used for Medical purposes. The Proprioceptive system when its doing its job. Designing for the cyclist culture. WT | Wearable Technologies focuses on wearables for cyclists. No wristbands this time around, just wearables that gives an insight into a cyclists performance and safety. Cobi is another program that allows you to track your fitness and performance. You can even call your friends and listen to music while riding your bike. Cobi dock is attached to the handle bars and designed to fit any kind of smartphone. As a cyclist, there is a lot of miscommunication that can happen on the road between all the traffic. especially in a country like u.s.a where cars feel entitled to the right away in most cities. what are some gadgets, systems, design methodologies that helped bridge this miscommunication or inconvenience of cycling. This product is capable of being a pamper throwing superhero. If anyone tries monkeying with it, a high-pitched alarm will sound, and you will be instantly notified on your smartphone. Should the thief proceed to steal the bike, you can use your phone to track its whereabouts. A weak electrical current is run through the cable, which lets the lock know when the cable is cut and the circuit is broken. Likewise, an onboard accelerometer and gyroscope will detect if the bike is being moved around a lot, and a temperature sensor will pick up on the presence of a cutting torch or liquid nitrogen. How is it not mandatory to have indicators on a bicycle? Using our natural proprioceptive mechanism to look towards the direction we are steering ourselves in, I began working on a helmet that would be designed to read the direction we are turning in and automatically turn on the corresponding indicator light, communicating to the driver behind us our choice of direction. Using Arduino, LED lights and the propriometer, I started working on the circuit board and learned very quickly that the coding for adjusting the propriometer to the helmet was going to take more time than i had perceived. LED lights that would blink in relation to the tilt of the propriometer. The propriometer uses the x, y and z axes to determine its position in space. By determining certain co-ordinates as point zero, I could code the output to react to any change in the co-ordinates in relation to the 0. I decided to start working on the outside casing with acrylic plastic. Looking back at some of the products and work from Eindhoven, I noticed how light transfered with more expansion through a perforated surface. I ran some tests and decided on some product shapes that would work for my model. The end result were a couple of molds for the casing of the product, and an Arduino circuit that turned on. The code for making the helmet respond to the propriometer was another project in itself. I was compelled by the conceptual thought behind “breaking the rules” and the effective use of distortion to create an interactive “functional” element. I tried doing my own ruler and decided that perhaps I might explore this material and technique with other visual language on it and possibly take it back to my practice as a graphic designer. Additionally, I had a direction to a completely different line of work as a fine artist. 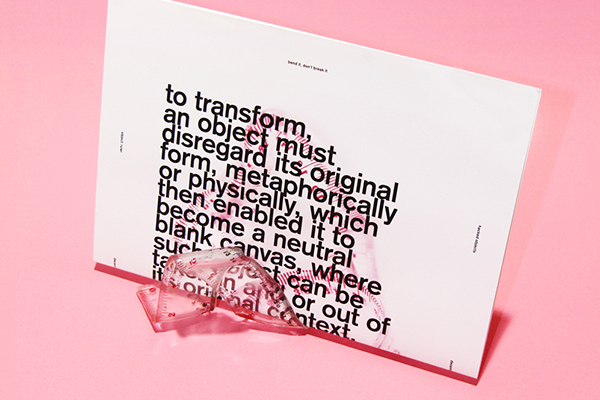 The transparent quality of the melted plastic posters intrigued me and gauged my exploration in visual communication, after which i pursued my following projects: "Everything's under control" and "Content"